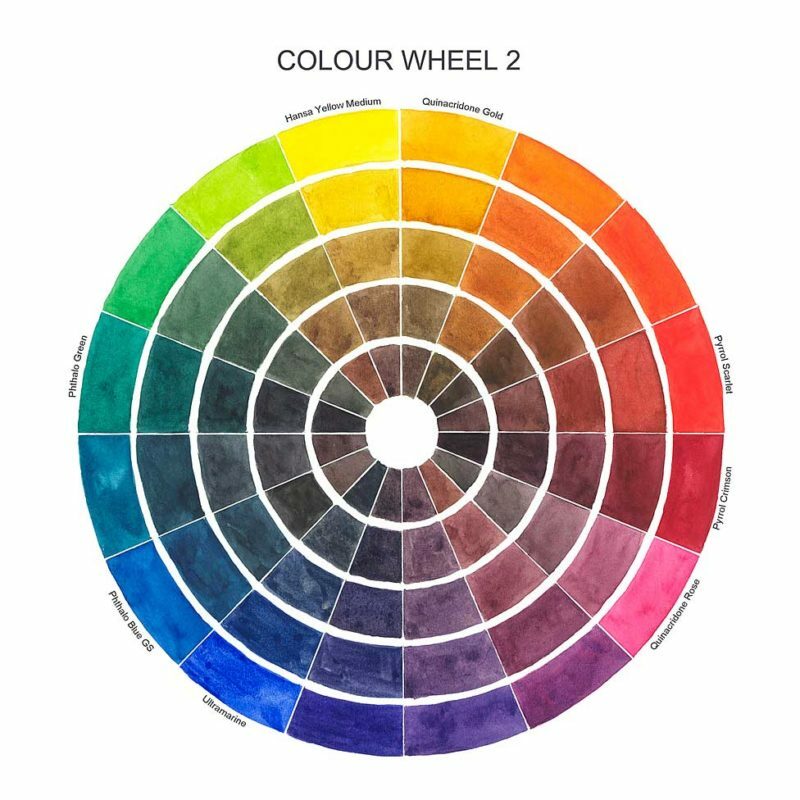 I’m thrilled to announce the Ultimate Mixing Palette, a collaboration with Jane Blundell, an Australian artist, instructor, and color expert. 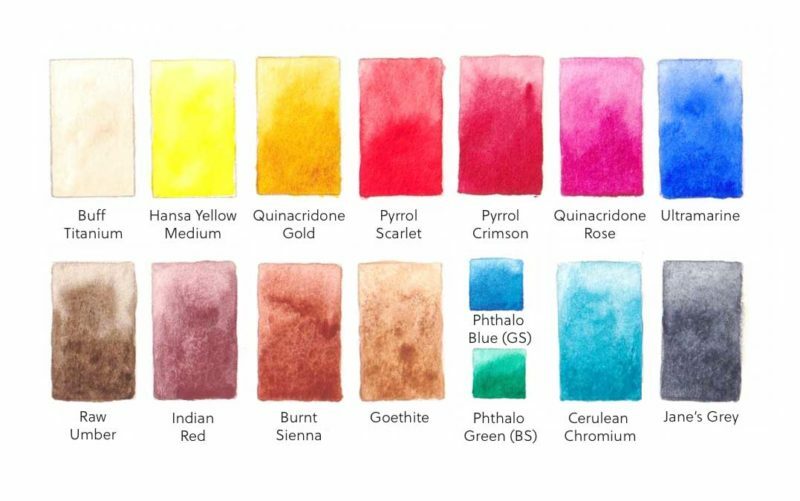 Jane designed and selected this set of 15 Daniel Smith watercolor paints as a versatile palette for mixing vibrant colors, as well as showcasing a variety of watercolor properties, from transparent to opaque pigments, to staining and granulating ones. The fifteen pigments include a range of primary colors and rich earth tones, as well as Jane’s favorite neutral mix that was recently released by Daniel Smith as Jane’s Grey. Each color fills one standard pan except for Phthalo Blue (GS) and Phthalo Green (BS). These intense pigments are in mini pans and a little dab of their color goes a long way! The palette is accompanied by a bi-fold guide to the colors, and can be complemented by Jane’s book, The Ultimate Mixing Palette: A World of Colors, first published in 2015. This book is a comprehensive and inspiring reference guide with charts for two and three color combinations you can create with the fifteen colors. You can purchase it either as a soft or hard cover book, or as an ebook download through Blurb, and for the month of April only, Jane is offering a special 15% discount on all paper copies (the discount is included in the pricing). 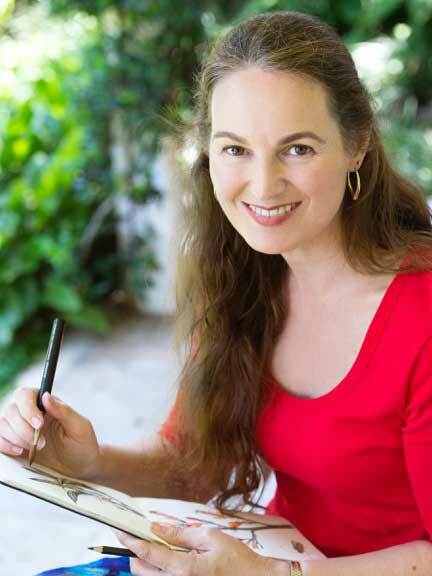 Jane and I first became acquainted online years ago through our mutual love for sketching and watercolor. I look to her as a color mentor and am always inspired after conversations, whether to experiment with new tools or try a new pigment. We finally met in person while Jane was visiting Seattle to teach workshops in 2015, first to chat and share supplies, and later for a sketch date. 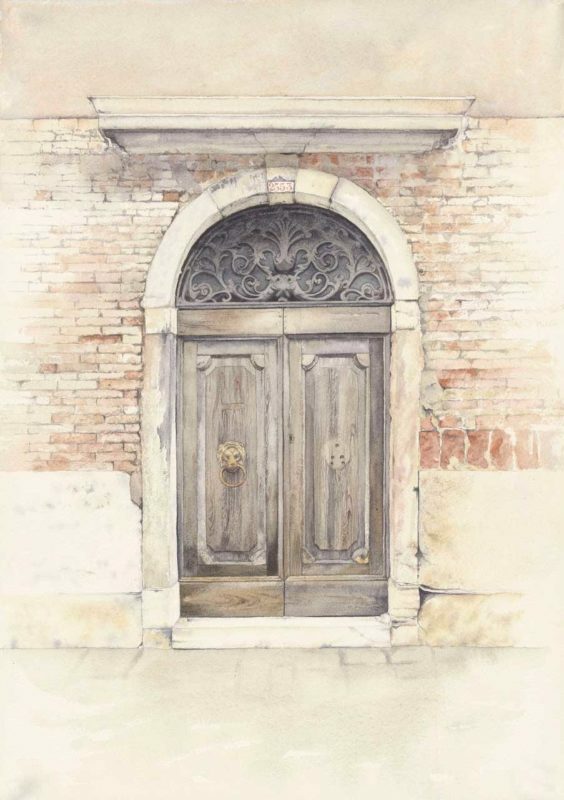 Jane stands out among artists with her dedication and passion for watercolor color properties, as well as her generosity in sharing her expertise through her extensive website. The Ultimate Mixing Palette is limited in quantity so get yours while supplies last! You say 15 colors but I count 14. Hi Jeanne, the palette includes two mini pans, one each for the Phthalo Blue (gs) and Phthalo Green (bs). Both are very intense pigments, so this allowed us to include the useful Jane’s Grey as well. I got my Pocket Palette some time ago; it is wonderfully small and light! I’m so glad you are enjoying your palette, thank you for your note! Hi there! I know you said they are water color but are they gouache or regular water colors? I love the colors included in the palette and would love a set like this in gouache. Thanks! Hi Jade, thank you for your note! 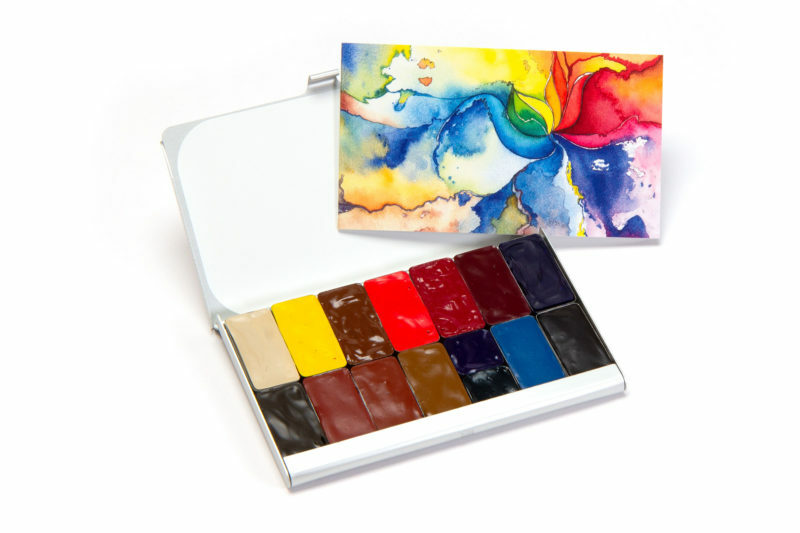 The paints included in this palette are all Daniel Smith watercolors. I’m not personally as familiar with gouache, although I do like to use white gouache and sometimes add it to my colors to increase their opacity. 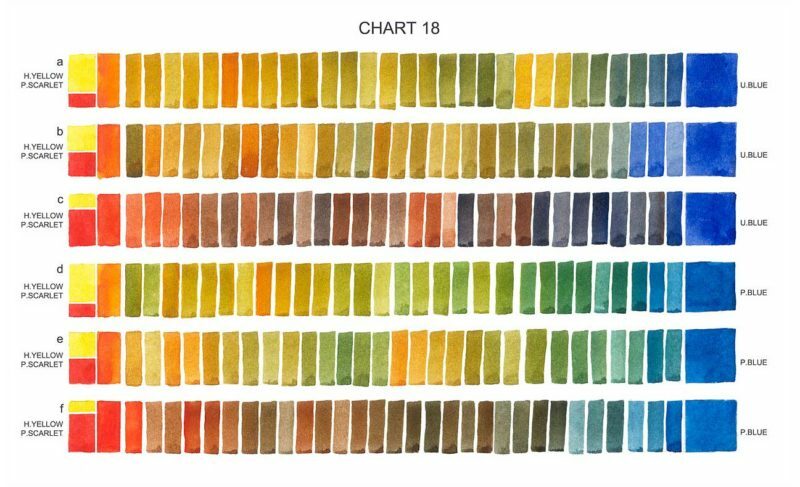 My palettes are also available empty if you’d like to create your own gouache version!